Supporting data for "Giardia Secretome Highlights Secreted Tenascins as a Key Component of Pathogenesis"
Giardia is a protozoan parasite of public health relevance that causes gastroenteritis in a wide range of hosts. Two genetically distinct lineages (assemblages A and B) are responsible for the human disease. Although it is clear that differences in virulence occur, pathogenesis and virulence of Giardia remains poorly understood. The genome of Giardia is believed to contain ORFs which could encode as many as 6,000 proteins. By successfully applying quantitative proteomic analyses to the whole parasite and to the supernatants derived from parasite culture of assemblages A and B, we confirm expression of ~1,600 proteins from each assemblage, the vast majority of which being common to both lineages. To look for signature enrichment of secreted proteins, we considered the ratio of proteins in the supernatant compared with the pellet which defined a small group of enriched proteins, putatively secreted at a steady state by cultured growing trophozoites of both assemblages. This secretome is enriched with proteins annotated to have N-terminal signal peptide. 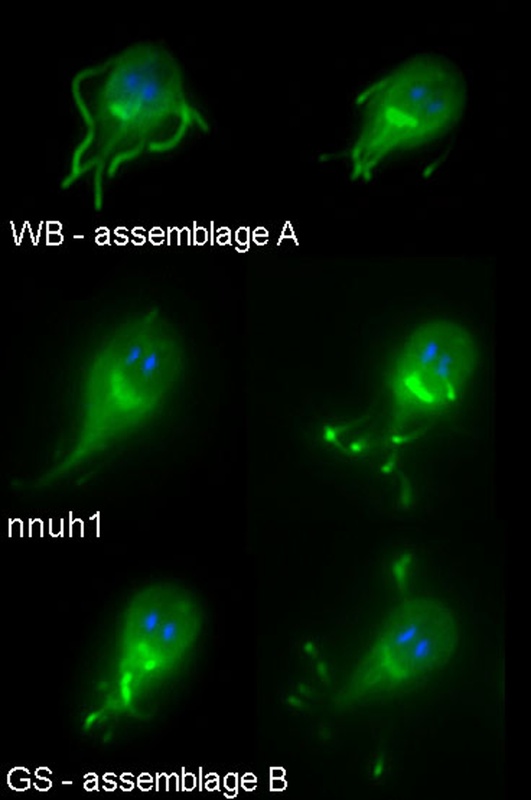 The most abundant secreted proteins include known virulence factors such as cathepsin B cysteine proteases and members of a Giardia superfamily of cysteine rich proteins which comprises VSPs, HCMPs and a new class of virulence factors, the Giardia tenascins. We demonstrate that physiological function of human enteric epithelial cells is disrupted by such soluble factors even in the absence of the trophozoites. We are able to propose a straightforward model of Giardia pathogenesis incorporating key roles for the major Giardia derived soluble mediators. Displaying 1-8 of 8 Sample(s). Displaying 1-10 of 11 File(s).